Midnight in Paris Blu-ray Review. Woody Allen’s film Midnight in Paris is a retrospective on the idea of connections and missed opportunities. Auter director Woody Allen has finally found gold again. Churning out almost a film a year since his directorial debut over forty years ago, Allen’s Midnight in Paris was a surprising hit at the box office. Imbuing light comedy with elements of nostalgia, his new work highlights a return to his witty roots and displays an unparalleled triumph in regards to its fantastical subject matter. Enter Gil Pender (Owen Wilson) a disillusioned Hollywood screenwriter who yearns to break away from the superficiality of the North American film industry. Whilst holidaying in Paris with his fiancé Inez (Rachel McAdams), Gil is captured by the earthly delights of the city and determines that to become a ‘real’ writer he must immerse himself in the urban environment. Discontent with endless tourist adventures and stuffy tea engagements with Inez’s parents, Gil explores the city at night in hope of finding a muse from the picturesque scenery and cultural splendour. In true Cinderella fashion, when the clock strikes midnight along the Rive Gauche, Gil is indivertibly transported to Paris in the 1920s, a time he continuously proclaims as the Golden Age of thought. Returning each night, Gil rubs shoulders with the likes of F. Scott Fitzgerald (Tom Hiddleston), Ernest Hemingway (Corey Stoll), Gertrude Stein (Kathy Bates) and Salvador Dali (Adrien Brody), with Stein critiquing his work in much the same way as she did with Hemingway. Gil also catches the eye of Picasso’s mysterious muse Adrianna (Marion Cotillard), who like himself, desires a time that is not her own. Caught between the past and present, Gil is forced to confront his own inadequacies concerning the direction of his life and choose how he wants to live in his future. Allen’s departure from the darker tone of his more recent films is surely the best choice he has made in a decade. The simple plot is riddled with tongue-in-cheek references to the glorified past and Allen makes sure to insult the very craft that has made him so renown. The greatest impact of Midnight in Paris is the examination of the human desire for a time that has long since flown. We always speculate ‘Wouldn’t it have been great to live in this era?’ and in this offering Allen tackles the What If’s of life head on. As the lead, Owen Wilson has perfect sincerity in his portrayal as the whimsical Gil. Although he takes on a lesser version of the Woody Allen method, Wilson manages to convey the same neuroses of unfulfilled dreams and social disconnection that are paramount within any Allen film. As Gil’s fiancé Inez, Rachel Adams is excellent and her interactions with Michael Sheen’s pseudo-intellectual are faultless. Sheen’s character Paul is the kind of man Inez wishes Gil to be, without compromising his high paying job or his house in Malibu. It should be noted that French First Lady Carla Bruni makes a brief but memorable cameo as a tour guide who exposes Paul’s surface intellect as the farce that it is. The spotlight however is completely on the ‘Lost Generation’ of Paris, with Bates, Cotillard and Brody putting particular emphasis on the artistic cliché. Stoll’s Ernest Hemmingway can’t go out for a night without recalling the poetic horrors of war and Zelda Fitzgerald (Alison Pill) is a mess every time drink is added into the mix. If we were to meet these pinnacles of American lore, Allen’s appropriation of their character is spot on. He uses the magic of Paris and the mystery of artistic greats to examine why we are so intrigued with past and how our future is affected by our preoccupation with memory. 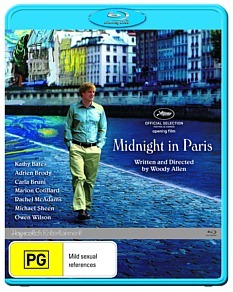 Woody Allen’s film Midnight in Paris is a retrospective on the idea of connections and missed opportunities. He does not preoccupy us with the idea of time travel (although bring on the DeLorean any day) but uses our reverence of the past to explore flaws in human relationships. It is heartening to witness that Allen himself feels no anxiety towards his past work and is able to look always to the future for more creativity. Be it the bustling streets of Paris or the quiet interior of Gertrude Stein’s parlour, we are constantly exposed to a comedic brilliance that has been sorely missed. Welcome back Woody.